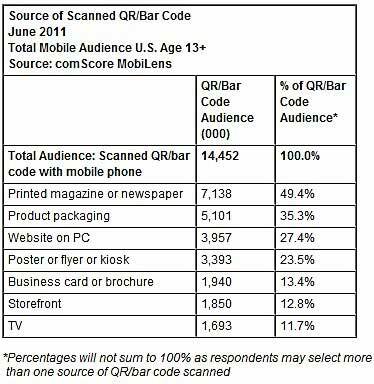 Some 14 million mobile users in the US—or 6.2% of the total mobile audience—scanned a QR (Quick Response) or bar code on their mobile device in June 2011, according to data from comScore MobiLens. The most popular source of a scanned QR code was a printed magazine or newspaper, with nearly one-half (49.4%) of mobile audiences scanning QR codes from that source, followed by product packaging (35.3%). More than one-quarter of mobile users (27.4%) scanned a code from a website via PC and 23.5% scanned codes from a poster/flyer/kiosk.